Take the belt in both hands, and find its mid section. 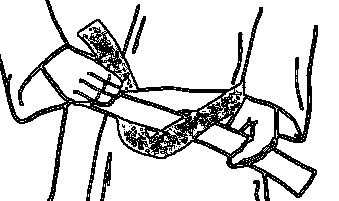 Pass it once around the waist, from the front as shown. Bring it together with the left end over the right end. Feeding the outer belt end underneath all the wrapped around sections of the belt begins the knot. 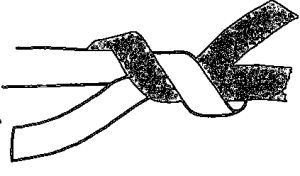 It is finished by tying the two free ends right over and through the left as in a “Reef knot”. 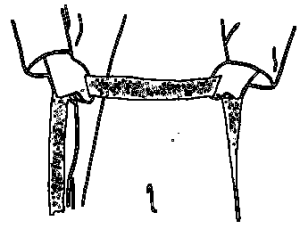 The belt should be tied reasonably tightly so that it will not come undone. As part of the general self-discipline of your art, it’s very important to make sure that your belt is of even length on both sides, and tied with a neat, flat knot. The belt goes around the waist twice. 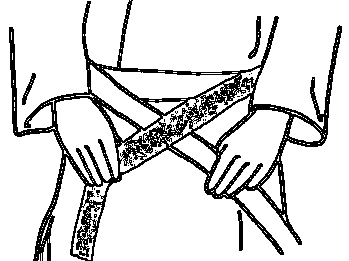 It is symbolic of the original Obi (sash) that was worn. This would be used to carry the Daisho (set of two blades, often a long sword and short sword) as well as other weapons and utensils. The long sword would go through both belts and the short sword between the belts. 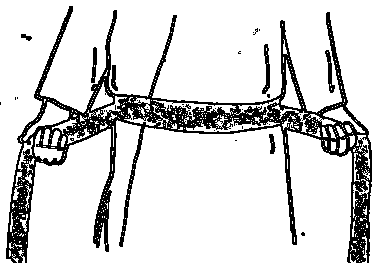 This would be to stop the swords tapping against each other and making any noise. 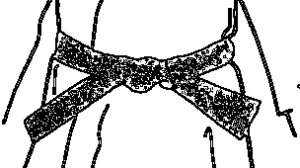 Make sure you are also wearing the jacket of your dogi (training uniform) correctly, with the left side crossed over the right.